The Prime Minister David Cameron and Deputy Prime Minister Nick Clegg have given their first news conference together in the garden of Number 10 Downing Street. Mr Cameron said the UK's first coalition in decades marked a "historic and seismic shift" in British politics and said it would be united by the wish for strong and stable leadership. 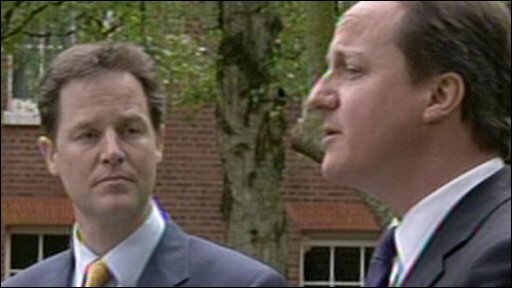 Mr Clegg said there were "big risks" but that it would be a "bold, reforming government" making Britain fairer.